Stephanie Valentin's thoughtful and poetic work asks us to consider the interconnectedness of living systems and the way human activity imprints itself upon the environment and living organisms. As a result of global warming the delicate and complex balance of ecosystems is rapidly changing. Recent studies show that up to a third of all species may be destined for extinction if climate trends continue for the next 50 years. In Ether Valentin takes as her subject, insects, the building blocks or foundations of the food chain. Insects, despite their pivotal role in the ecosystem, are relatively hidden from view. The only time they seem to break into our consciousness is when they are out of balance. 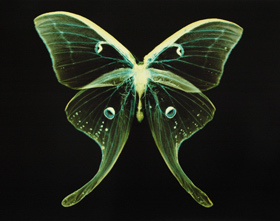 Working with large-scale colour photograms Valentin magnifies a series of insects to almost human scale. At this size they possess a surreal otherworldliness while appearing curiously anthropomorphic. From moth and lanternfly to stick insect, there is a distinct poignancy in experiencing these tiny creatures at extreme magnification, revealing details such as the delicate lacework of a grasshopper's wings. In smaller photograms Valentin creates startlingly original images where ants, bees, beetles and plants form an interplay with the body, suggestive of human intervention and also of relationship. Scientific vessels meeting with organic forms create magical yet disturbing images evocative of natural systems askew. Moisture and vapours are present in most images representing the essential elements in living processes. By refining the photogram technique and through the manipulation of scale, Valentin has heightened the experience of encounter and wonder while refocusing our attention upon important ecological issues. Ether reflects upon the unwitting engagement of the "landscape as laboratory", and an altering of the chemical composition of air and ocean, an experiment with increasingly complex consequences. Stephanie Valentin's previous exhibitions at Stills Gallery were Fathom in 2004, Pollinate in 2002 and Chiasma in 2000. Her work is held in the collections of the National Gallery of Australia, the National Gallery of Victoria and Parliament House, Canberra.